It was a scene played out over again and again on Chicago’s West Side. Shocked and dazed from the bullets that just entered his body, a young black man was carried into an ambulance on a stretcher and whisked away to the nearest emergency room. The window of the sub shop he walked past exploded, and the ominous tiny yellow tents marking the location of shell casing were strewn about, amidst a sea of broken glass. Everyone inside the shop was fine. The employees are protected by a thick bulletproof glass, and it’s only possible exchange food for money with a revolving bulletproof glass door. There is nowhere to sit in the shop. These sub shops are everywhere on the West Side, a constant reminder in an already economically depressed neighborhood that normal commerce is just too dangerous here. The Chicago Fire Department paramedics displayed the emotions of factory workers assembling a product for the hundredth time. And it’s actually possible that the number of shootings that one of the more seasoned-looking medic has responded to is in the hundreds. But like my father, a Chicago fireman with more than 30 years on the job, she probably lost count a long time ago. Unfortunately, it’s not just first-responders who experience these shootings. The people living and working near North Avenue and Central Avenue in Chicago’s Austin neighborhood—where the shooting occurred—had watched this scene play out many times before. In fact, the police scanner offered me three options of nearby shooting that occurred almost simultaneously. As we stood near the sub shop, a 20-year-old woman named Winnie estimated that the shooting was about the fifth time she needed to take cover from the bullets. She clearly wasn’t shaken. But in Winnie’s case, not every shooting she’s heard resulted in someone actually being struck with a bullet. In fact, I had arrived to a few “shooting” scenes last summer where no one was hit. And anyone listening to the Chicago police scanner on a warm night will notice that numerous calls for “shots fired” come in, but no bodies are found. 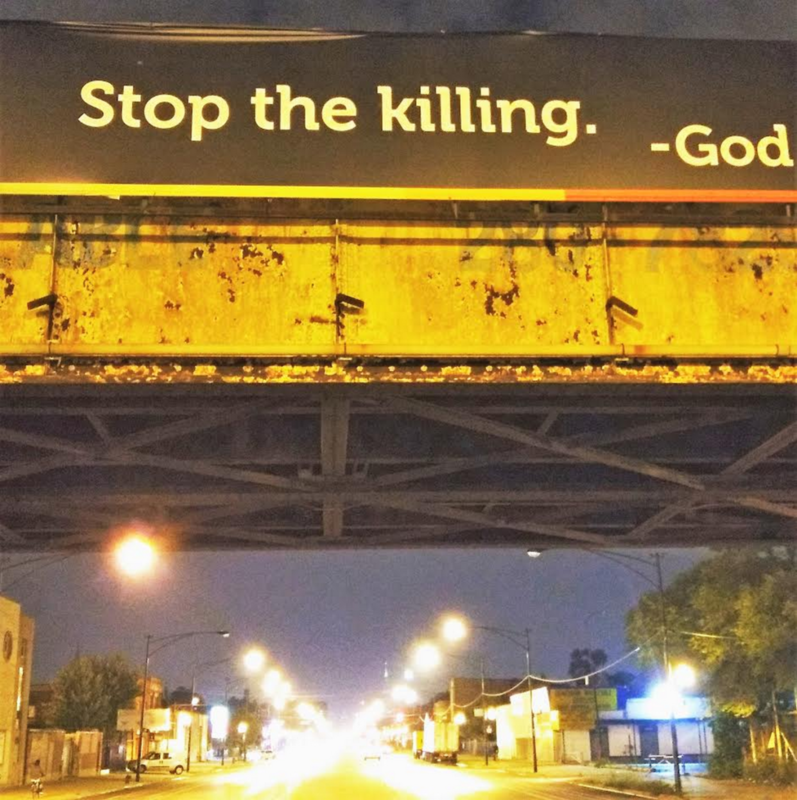 We know how many people are shot and killed in Chicago every year. In 2016, 4,332 people were shot and 762 died. Last year saw a slight decrease with 650 killed and 3,457 people shot. But what we don’t know is how many times shootings actually occur in Chicago, whether someone is hit or not. What I received provides a fuller understanding of the level of violence residents of Chicago’s most violent neighborhoods experience on a daily basis. In 2014, 42,417 people called the Chicago police to report shots fired. In 2015 that number rose to 46,996. Paralleling the spike in shootings in 2016, 67,160 people reported shots fired that year. Though still high, the number of people calling to report shots fired in 2017 dropped to 55,584. Again, this reduction parallels the drop in persons shot in 2017. This means that the number of people actually shot in 2016, for example, only accounts for six percent of the number of people calling to report shots fired in their neighborhood. Chicago’s Office of Emergency Management and Communications clarified that the numbers include some duplicates for the same shooting incidents—although they can’t identify how many. And some might wonder how many of these calls are residents mistaking a car backfiring or fireworks for a gun shot. Unfortunately, due in part to CPD’s evidence-collection protocols, it’s impossible to know for certain how many of these calls were actual shootings. When an officer arrives to a scene and no one is shot, no report is made, and no department database records the incident as a shooting, according to a FOIA response from the CPD. Even more astounding is the fact that “if shell casings are found in a reported area, yet there is no other crime or victim noted, those casings get inventoried and reported as ‘found property,’” according to the same FOIA response from the CPD. This means that even when shell casings are found the incident is not reported as a shooting. In 2016 alone there were 9,704 shell casing inventoried under this designation. That’s a 34-percent increase from 2015, and a 47-percent increase from 2014. Again, since these incidents are not investigated or even recorded by the CPD, there is no way to know for certain whether certain calls for shots fired were in error. But the strong correlation between calls for shots fired and shooting incidents indicates that the number of calls provides a fairly accurate picture of the scale of gun violence experienced by many Chicagoans. The disparities in the number of shots fired per neighborhood provides further evidence for this conclusion. Winnie and I grew up only about six miles from one another. But our experiences with shootings couldn’t be more different—although I do have a unique experience with gun violence. Unlike most people growing up on Chicago’s Northwest side, I’ve experienced some of the trauma brought about by gun violence. One of my first memories is my father trying on a bulletproof vest to wear to the firehouse. I’ve witnessed the trauma in my father’s face when he comes home after he’s responded to a call for a dead child, or a particularly grisly shooting. Just a few months ago he had to perform CPR on a young man who was still breathing but was missing most of his face. And still, I’ve only experienced a small fraction of the trauma visited upon families on the West and South Sides of Chicago. I’ve never even heard a shot fired in my neighborhood. Winnie, on the other hand, once lost track of her mother when bullets started flying near her home. “I thought she might be hit,” she said. But Winnie fortunately found her mother shortly after the chaos subsided. The number of shots fired calls bears out the disparities in gun violence in Chicago. In 2016 three out of every 1,000 people in the 16th police district—which covers my neighborhood, Jefferson Park—called to report shots fired. In the 25th district—which covers part of Winnie’s neighborhood, Austin—21 out of every 1,000 people called to report shots fired. Those numbers only changed slightly in 2017. Unfortunately, Winnie’s district is not even close to the worst. In the 2nd police district on Chicago’s South Side, 80 out of every 1,000 people called to report shots fired in 2016. That number dropped to 75 in 2017. Although these numbers will be a surprise to many readers, for those on the ground in Austin, and other violence-affected neighborhoods—the cacophony of gun shots is a part of life. I asked one gang member—an admitted “shooter”—to guess how many calls for shots fired are made every year in Chicago. He was remarkably close to the 2017 numbers. A few minutes later I witnessed firsthand how intensely this young man is effected by the constant threat and cacophony of gun violence in his life. I didn’t know, but luckily they simply drove away.